Have you ever found yourself manually opening WinSCP to the same server you’ve just SSHed into with mRemoteNG? Or wishing you were able to extract the password from the mRemoteNG connection? HTG will guide you on how to unlock mRemote’s true power. We gave an introductory tour of mRemoteNG in our “How to Use mRemoteNG to Manage All Your Remote Connections” guide. In this guide we will dive deeper and show you some tips that we have found useful when working with it on a regular basis. We’ve mentioned WinSCP in the past; this program should be already in your arsenal if you’re administrating Linux machines from Windows. Many people who’ve been enlightened to mRemoteNG are simply unaware that it is possible to integrate the two, and end up maintaining two sets of “connection databases”. More than that, a lot of the time, because mRemoteNG is such an “end all be all solution”, it is the only one to get “the love”, and every time WinSCP is invoked, the connection’s details are entered manually. All of the above can be easily negated through mRemoteNG’s “External Tools” feature. 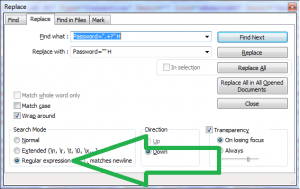 With this feature, it is possible to invoke WinSCP and pass to it all of the connections details that mRemoteNG already has. If you don’t have WinSCP installed, go ahead and do it now. 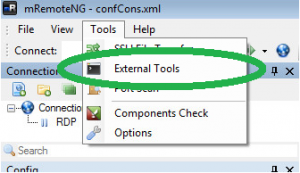 To add an “External Tool”, go to the “Tools” menu and select “External Tools”. The “External Tools” tab will open. Right click anywhere in the upper portion of the tab, and you will be presented with a menu to create a “New External Tool”. In the lower portion of the screen, change the name for the tool you are adding under the “Display name” row to be “WinSCP”. In order to use your new ability, right click on an SSH type of a connections’ tab, find the “External Tools” entry, and click on your newly created “WinSCP” option. Due to the fact that mRemoteNG holds all of the passwords in a reversible encryption (so that it can use it), it is possible to extract them on a per connection basis. To achieve this, we will have mRemoteNG pass the “password” parameter to be “echo”ed in a regular old command prompt. In order to use your new ability, right click on an SSH type of a connection’s tab, find the “External Tools” entry, and click on your newly created “Password Revealer” option. You’ve gotten tens or even hundreds of connection profiles in your mRemoteNG setup and then you get a new team member. You want to give your connection file to them, but if you do, you’ll be giving them your credentials… Fear not, for HTG has got you covered. We will show how to globally erase passwords from mRemoteNG’s connection file. Note: This will require you to bust out your uber geek, but it is not a very difficult procedure. First of all, you will need a Text Editor that is capable of doing “Regular expressions“, like Notepad++ or Sublime (we’ll be using Notepad++ for this example). Then, close mRemoteNG and in one of these editors open its connection file (which by default is under “C:\Users\%your-username%\AppData\Roaming\mRemoteNG”). Click on “Replace All” and do a “Save As” to create the sanitized file. Got an mRemoteNG trick that you would like to share? Send it to us in the discussion forum.